When we say "Azerbaijan", the first thing that occurs to us is Baku; when we say "Baku", we mean oil. Such is the fate of this city which is inseparably linked with oil. It seems to have ever been like this. There can still be seen flames bursting from the ground in the steppe near village Mamedli on the Apsheron peninsula. Competent people say that methane has been burning here since the times of Alexander the Great. Azerbaijan is situated in the eastern part of Transcaucasia. The country borders Armenia, Georgia, Russia and Iran. In the east it is washed by the Caspian Sea. Almost half of its territory is occupied by the mountain chains of the Greater and Lesser Caucasus. The country's climate is mild, varying from moderate to subtropical being sharp subtropical in the south of the country. One of the first states to emerge on the territory of present-day Azerbaijan is Manna state. Dating back to the 9th century B.C., this country had advanced for those days economy and culture. In the 6th century B.C. Manna was conquered by the legendary Media and Zoroastrianism became the official religion in the area. Of considerable importance for the history of Azerbaijan were two ancient states: Caucasian Albania and Atropatena, which was named after its ruler Atropat and which consequently was converted into Azerbaijan. In the early 8th century Azerbaijan was conquered by the Arabs and became part of Arab Caliphate. Islam spread all over the country as a leading religion, which inevitably had a big impact on traditions and cultureof Azeri people. Trade interests made the region join the transcontinental system of the Great Silk Road, a link between the East and the West. In the 11th - 14th centuries Azerbaijan was sequentially invaded by the Turks, Mongolian Tatars, and Tamerlane's army. Later there emerged independent khanates in Azerbaijan; however they did not last long. In the 19th century, as a consequence of Russian-Iranian conflict, Azerbaijani territory was divided between these two powers with the northern part of Azerbaijan being annexed to the Russian Empire. The national demarcation carried out after the October Revolution resulted in establishing the Azerbaijani Soviet Socialist Republic within the Transcaucasian Federation in 1920; in 1936 the republic got the status of Soviet Union republic. After the collapse of the Soviet Union in 1991, Azerbaijan regained independence. Azerbaijan with its capital Baku is the epitome of history of oil development which modern civilization so heavily depends on. Extraction of "black gold" in Apsheron has been carried out since the 7th - 8th centuries B.C. ; whereas oil refining started here as far back as the 13th century. Since old times the local people would use oil to light up and heat their houses, to caulk their flat roofs; and in wartime they used oil to make incendiary shells. Today Azerbaijan still remains one of the world's largest suppliers of oil. Besides old oil extracting facilities, there is a unique plant of deep-water extraction installations; floating oil drilling rigs are operating in the country. 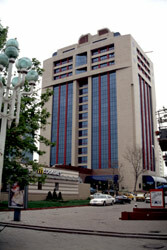 Baku, the capital of Azerbaijan, is a modern industrial, scientific and cultural center. The population of the city is almost two million people, which accounts for over half of the total number of urban population of the country. 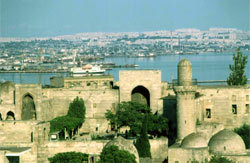 Baku has always been a great metropolis, which has been propagating culture in the East. It was Baku where the first national theatre was set up in the Muslim East and where the first Azerbaijani opera was performed, where the first Azerbaijani newspaper was published, and where the first national library was opened. Today there is a university and twelve other higher education establishments, 6 theatres, and about 30 museums in Baku. The best way to get to know places of interest of Azerbaijan would be to start with its capital. 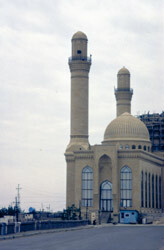 Maiden Tower in Baku, built in the 12th century, is a unique piece of fortification. This monumental building with eight tiers is 28 meters high. Another construction, which deserves attention, is the castle of Shirvanshakhs, built on a rocky island in Baku Bay in the 13th century. Its fate is rather dramatic. In the 14th century owing to the rise of water level in the Caspian Sea the castle found itself completely underwater, and it was only in the 18th century after the sea became shallow that this unique architectural construction came in sight anew. The royal architectural ensemble of Shirvanshakhs built in the mid-15th century in Baku is considered the acme of the medieval royal architecture of Azerbaijan. It consists of a two-storeyed palace, a burial-vault, a mosque with a minaret, divankhona ("a ceremony hall"), Seyid Yakhia Bakuvi's mausoleum, and the Murad gates. Decorated with intricate stone carving, the majestic portals of the buildings add to the grandeur of the complex. The ensemble has a status of a state museum and is one of the most popular tourist attractions. Dating back to the 12th century, the decahedral mausoleum Momine-Khatun in Nakhichevan is no doubt an architectural masterpiece. The height of the mausoleum is 34 meters; it is skillfully decorated with intricate geometrical ornament and citations from the Koran. Almost in every part of Azerbaijan there have remained architectural monuments dating back to different periods of the country's history. Thus the time of khan's reign is marked by construction of palaces and citadels. Among them there stands out the majestic palace of the Shekin khans built in the 18th century. The facade of the palace is decorated with a beautiful stained-glass window; the interior is richly decorated with geometric patterns and scenes of battles and hunting. Each country as a rule has its own distinctive natural character, its natural emblem. For Azerbaijan such an emblem is the Caspian Sea. This water body is a unique natural phenomenon. The actually world biggest lake is so large that it has all the rights to be called 'sea'. Besides, it has salty sea-water, sea-like currents and sea-strong winds. In terms of fish resources the Caspian Sea is really phenomenal. It is a habitat of the world's largest shoal of sturgeons. The Caspian herring, sturgeon and Caspian black caviar are world recognized delicacies. All the rivers supplying the country with water belong to the Caspian Sea basin. Some of them flow into the Kura River, some - into its tributary the Araks, the rest flow directly into the Caspian Sea. Azerbaijan is located on the joint of Europe and Asia (the frontier extends along the Caspian Sea). Yet the country's "facade" overlooks the East. And one of the main highways connecting Azerbaijan with Central Asian countries was the Great Silk Road. The nature of Azerbaijan is rather diverse. Vast flat lowlands lying below sea level and mountain peaks the height of which exceeds 4000 metres, torrid deserts and cool alpine meadows, lifeless salt-marshes and thick subtropical forests. Several climatic zones are present on the territory of the country. Plains are the habitats of a variety of rodents, reptiles and jeyran - local type of deer. In the forests on the mountain slopes one can meet wolf, bear, lynx, wild boar, and deer. In shallow creeks there nest a great number of various birds. Numerous natural reserves promote preservation and protection of unique flora and fauna of the region. Today's Azerbaijan is a secular independent state which builds its future on the democracy principles. For centuries natural fire has been burning from Azerbaijani ground, for centuries the country has been washed by the sea waves. And today the elements of fire and water provide the basis for the country's present and future economic prosperity.